Ah, good ol’ dad. Always there for me when I needed permission to do something my mom already said I couldn’t do, or when I wanted to hear scary stories that would keep me awake with fear all night. Father’s Day is looked at by many as a somewhat dubious holiday, dads just seem to have enough fun already. My mom used to joke that every day was father’s day, except Mother’s Day. But if pancakes and pirates have a day, then my old man surely deserves one too! So, to get everyone in the spirit of Father’s Day I’m going to tell the stories of two of the most embarrassing dads in history, dads who will make you want to go out an buy a necktie-present right away. “Brita and I” by Carl Larsson (1853-1919). Source: Wikimedia Commons. The first frustrating father that we will discuss is Akhenaten, the father of the boy king, Tutankhamun. Akhenaten’s name was originally Amenhotep IV, that’s the name he had when he ascended to the thone upon the death of his father, Amenhotep III in 1353 BCE, but he ended up changing it a few years into his reign for reasons that will be explained later. A few years into his reign, the new king started building temples dedicated to a new God called the Aton. The Aton was an unusual god. Instead of being anthropomorphic (human shaped), like other Ancient Egyptian Gods, the Aton was depicted as a sun disk, with little rays of light beaming out of it. At the end of each ray was a little hand, sometimes shown touching the Pharaoh and his family. I guess this depiction is supposed to suggest the omnipotence of the sun’s light, but it’s also a little creepy. Amenhotep eventually changed his name to Akhenaten ( meaning “beneficial to Aton”) and around that time decided to build a new capital city dedicated to his favorite god. The city was called Akhetaton. The king favored his new god so much that at some point in his reign Akhenaten began a campaign to chisel away all images of the god Amun, whose cult had been the most prominent in Egypt for centuries, and who now essentially competed for worshipers and offerings with the Aton. Temples dedicated to Amun were closed down and Egyptians were encouraged to worship only the Aton. In a culture where for thousands of years people were free to worship a multitude of gods, this was a big deal. 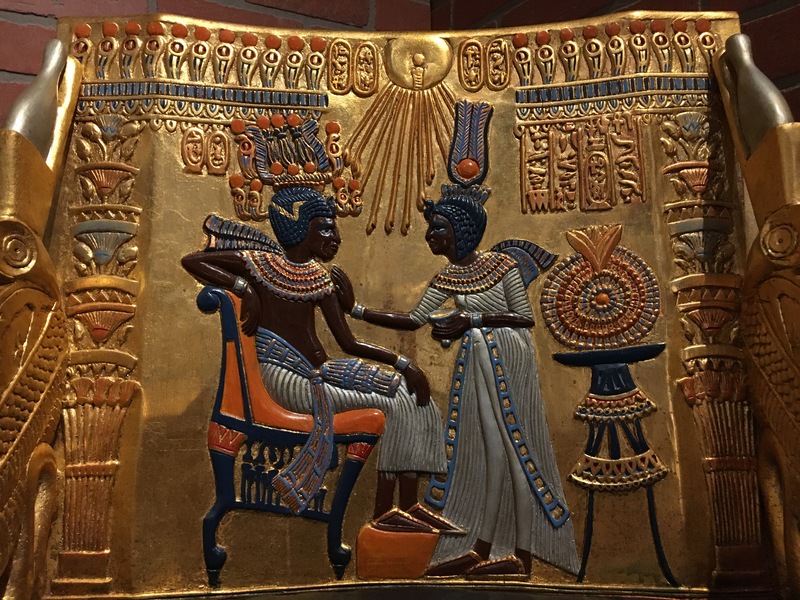 On this replica of a throne found in King Tut’s tomb, the Aton is visible above the two central figures, its tiny hands stretched out towards them. Between the religious controversy, moving the capital of the empire some 200 miles from its traditional home and decorating the new city with a new style of artwork (replacing an artistic style that he been used for thousands of years) Akhenaten began to lose favor with the public. Some scholars have also suggested that Akhenaten took a Pacifist attitude to international politics and forced Egypt into a period of isolationism, but there is not enough evidence to know that for sure. After Akhenaten died a mysterious pharaoh named Smenkhkare (who may have actually been Akhenaten’s queen, Nefertiti) ruled for three years and then his son Tutankhamun, took over. Now I’ll admit that I’ve had to clean up messes left by my dad before ( I can neither confirm nor deny that I have rushed to the store on countless Mother’s Days and Anniversaries to buy presents at the last minute. In exchange for pizza, of course), but nothing quite like this. King Tut became king when he was just nine years old, and even at that age he understood that his dad had messed up big time. He abandoned the city his father had built in the third year of his reign, returning the Capital to Thebes. He then reinstated the old religion. King Tut’s entire reign (admittedly a pretty short reign) was spent fixing his dad’s mistakes. However, this did not end the frustration the Egyptian public felt toward Akhenaten and his family, and later generations would erase them all (including Tut) from history by scraping their names and faces off temple walls. 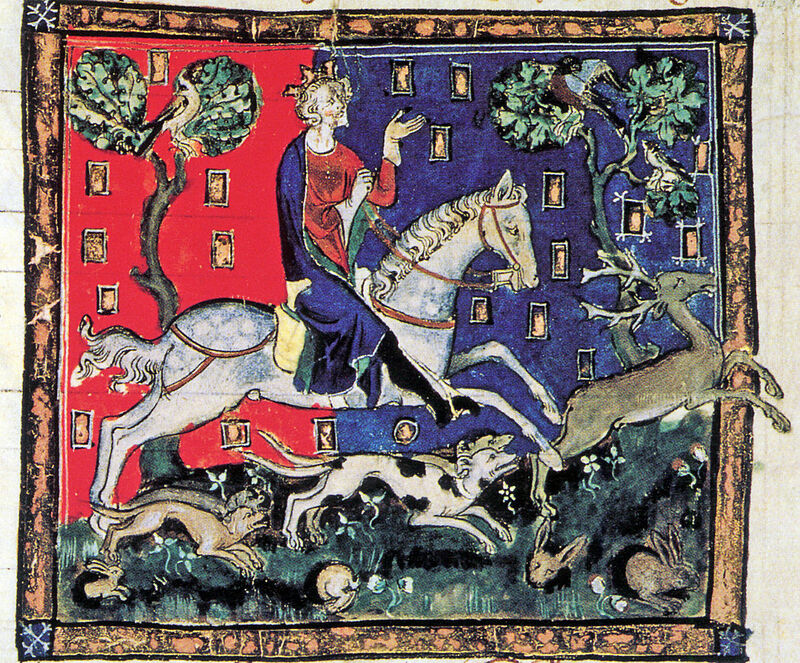 King John of England on a stag hunt, 1167-1216. Illuminated manuscript, De Rege Johanne. Source: Wikimedia Commons. The next embarrassing dad we’ll discuss is King John. John started off his reign fixing the problems left behind by his own embarrassing dad, Henry II. During his reign Henry had managed to kill off the very popular (and now sainted) Archbishop of Canterbury, Thomas Beckett, and to sire a quartet of bratty kids who spent years warring with each other and their father over land. After John’s elder brother, Richard, ascended to the throne upon Henry’s death John tried to seize power multiple times, always failing. Luckily for John, Richard managed to get himself shot by an arrow while besieging a castle held by a rebellious baron on France. John was finally able to become king, but by that time his empire was in chaos. In the first few years of John’s rule, the monarch lost most of his territory in continental Europe ( at that time John’s family, the Angevins, ruled not only England but several territories on the continent). Admittedly this wasn’t completely his fault. Oftentimes when new rulers came to the throne during the Middle Ages, rival monarchs would try to take advantage of their potential weakness by invading territory. However, what happened next is John’s Fault. The king launched a number of military campaigns to regain his lost territory. These campaigns were funded by taxing and penalizing the English in every way imaginable. He even gave away his Kingdom to the Pope at one point in exchange for support. In the end, all endeavors to regain territory failed and support back home was dwindling. The barons of England revolted and John was forced to sign the Magna Carta, this was the first time a Monarch had ever been compelled to sign a document that was intended to limit their authority. 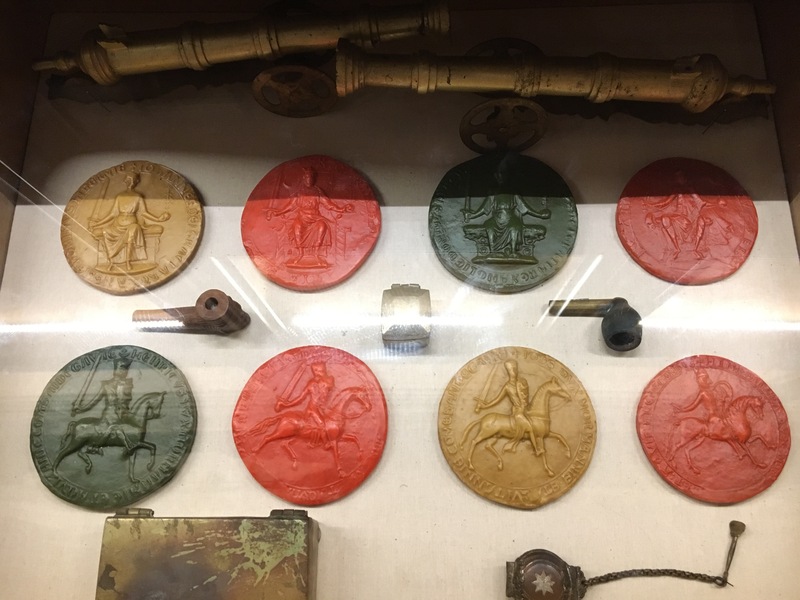 A collection of replicated royal seals, including those of Richard and John (the four on the left side) displayed in our Cabinet of Curiosities. After John’s death in 1216 his son, Henry III, became king at the age of nine. Young Henry took the throne at a time when England was being torn apart by conflict. King Louis VIII of France had invaded England with the support of rebel English barons. Louis held a big chunk of southern England in 1216, but luckily some of the rebels became a little more patriotic after John’s death and decided to support his young ( and impressionable) successor. Louis was kicked out of England. The Barons were still wary of tyrannical monarchs, though, so one of the first things they had young Henry do after being crowned was to re-sign the Magna Carta, which spelled out what he could and could not do. Henry spent the majority of his reign under the watchful eye of the powerful Barons. As goofy and embarrassing as you may think your dad is, I’m sure he’s nothing compared to the dads we’ve talked about in this blog. So why not go ahead and celebrate, just to say thank you for not being so embarrassing if for no other reason. If you’re looking for a place to take him, why not come and see our exhibit halls? The stories told in this blog are just the tip of the iceberg that is the wealth of entertaining knowledge to be gleaned from our artifacts. Have fun!